National Player of the Week - Division 1 honors for the week of Oct.25th goes to Trey Taylor, of Elkhart Christian Eagles (Elkhart, IN). The National Homeschool Football Championship Series (NHFCS) is pleased to announce Taylor's selection as the National Player of the Week - Division 1, for the 8th week of the 2013 Season! Taylor was nearly an unstoppable force in the Eagle's game last Saturday, in an afternoon game with Tri-State Crusaders of Leo-Cedarville. Trey ran for a season-high and team record, 200 yards. His 3 rushing touchdowns were not the only contribution. On defense, he had 1 sack, 1 pass defense, and 9 tackles. His 80 yd burst on one carry, was the difference in the game. This was a career best performance in many ways, for the 6'1", 200lb. Senior. Maxpreps also added to Trey's accolades by designating him the player of the game. Coach powell said, in an interview after the game that Taylor's potential is incredible. Coach Trivett is just one of many Elkhart fans who want Trey to continue football at the college level. performance; as well as an unapologetic positive encouragement for young men to pursue the greatest causes for God's glory. We're posting the latest info we have, but so many great players are not going to be eligible unless their coaches or statisticians get their game stats posted on Maxpreps. This is the time of the year when many hundreds of colleges look for the best new prospects. We believe homeschool football players are among the very best college prospects for most colleges. We also believe the homeschool athletes have earned the decency of having their real accomplishments recorded publicly. They showed up for practice, followed the rules, represented the community with honor, and played by the rules. Parent's if your teams stats are not fully published, ask what you can do to assist in the task. Tevon Valdez North Georgia ? Chase Bryant Dallas HSAA ? Noah Behrman Dallas HSAA ? Chet Bryant Dallas HSAA ? Franklin Mcdavid Oklahoma City Legion ? Johnson Miller Oklahoma City Legion ? The National Homeschool Football Championship Series (NHFCS) is pleased to announce the player selected as the National Player of the Week - Division 2 for the 8th week of the 2013 Season! Nathan Beggs, of Tyler HEAT (Tyler, TX). Beggs was nearly an unstoppable force in the HEAT's game last Friday against the Riders of Forth Worth (TX) THESA. Nathan's performance through the air and on the ground spoke far beyond the final score. On the ground, the HEAT's QB/RB & DB racked up 166 yards on 13 carries and found the End Zone 3 times! Through the air, the Junior went 6 of 10 for another 156 yards and 3 more Touchdowns. The Defensive side of the ball found Nathan with 6 solo tackles and an assist. He took things a step further on Special Teams where he had 4 Kickoff Returns for a total of 79 yards and scored 2 more points on PATs. Unforunately, the final gun did not find the HEAT with a victory but the tightly contested game was by far one of the most competitive games in the country. Congrats to Nathan & the HEAT for a great game! For teams who have not posted player stats, you still have time to catch up on the data input and help your players get earned recognition and college opportunities. With so much on the line in both divisions, The NHFCS is posting a Double for this week's GAME OF THE WEEK. In division 2, The #2 and #5 teams play for State seeding and conference honors. The impact could also propel one of them into the #1 national spot, depending on a number of factors. Hope & Evangel have a passionate rivalry and great respect for the capabilities they each possess. But as fellow Christian teams, they are committed to integrity and excellence, first. 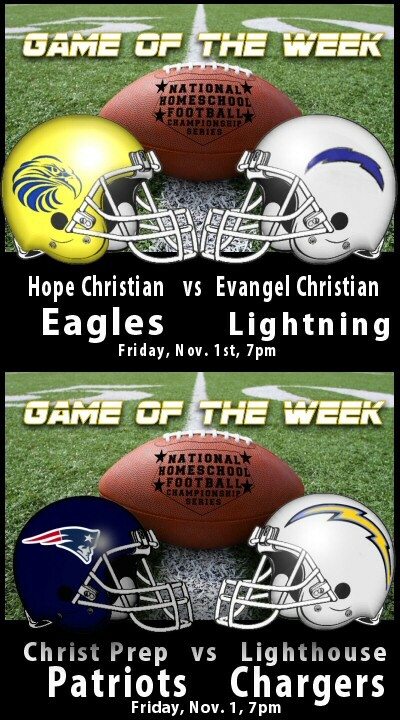 Both Christ Prep and Lighthouse have had national honors, and both teams are on a surge this season. Christ Prep has moved to the #7 ranking this week and Lighthouse is battling to stay at the #1 position. These two division 1 rivals have a great tradition of excellence and solid reputation for sportsmanship. The NHFCS is looking for local fans to post live coverage ofthe games via social media or video webcasts. If anyone posts a commitment, we will post the link, here. This is one of our biggest ranking charts, ever. 39 homeschool division 2 teams have played most of their 2013 schedules. It is a monument to the innovations of countless homeschooling groups, visionary parents, and ambitious student athletes. Texas Homeschool teams who are part of the State T-CAL playoffs will want to pay particular attention to these rankings. Your state tournament seedings will be determined by the MAxpreps rankings reflecting week 8 of your regular season. Some of the teams have already entered playoff competition. Their games will have more than double the ranking impact of a regular season game. This is a time to finish strong and leave no effort behind. The NHFCS will continue posting weekly rankings updates until December 2nd. Any late edits after that date will not impact our race for the national championship, unless it is part of an official investigation of fraud or other serious infractions. This is our biggest ranking chart ever. 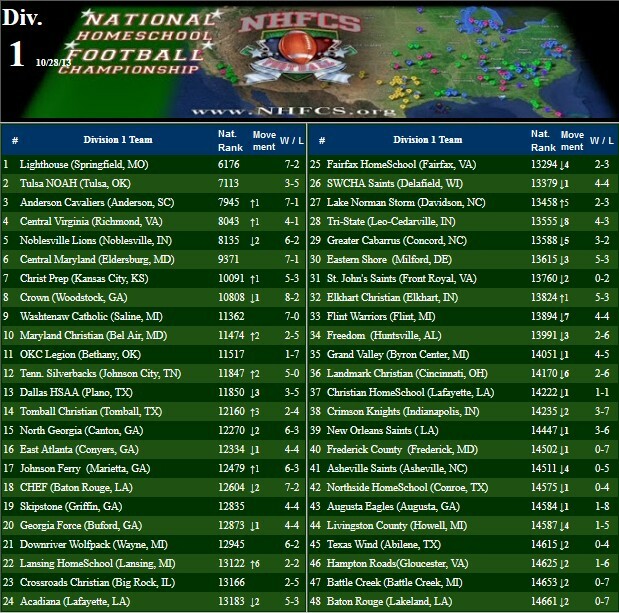 48 homeschool division 1 teams have played most of their 2013 schedules. It is a monument to the innovations of countless homeschooling groups, visionary parents, and ambitious student athletes. One of the most frustrating struggles for the winning team is to watch their computer ranking slide a few days later. If this happened to your team, we all 'feel your pain', but trust me, it wasn't personal. I just visited Ben, a former homeschool player who was so excited to see his former team's ranking in the new rankings, but his giddiness turned to a mixture of bewilderment and being personally violated. We reviewed some additional factors and resolved his confusion, but his disappointment will take a bit more time. If you dig into the internals of your ranking, you'll see 2 major sections; "Power Rating" and "Strength Of Schedule" (SOS). That second listing is what we'll focus on in this post. "How did each former opponent do this past weekend?". We got our answer when we discovered that 5 of the 8 teams lost this weekend. A hit like that can wipe out any ratings gains from a 40 point win against a weak team, this weekend. The college football BCS uses some of the same dynamics we see in the Freeman Scoring at Maxpreps. I once visited with the Oklahoma State University QB and asked him about the fierce bedlam rivalry they have with the University of Oklahoma. "We like OU", he said. "We hope they win every game next season, except one". That response may seem more like diplomacy than strategy, but it is, in fact, brilliant math. If every team you play wins every other game in their regular season, you will have the greatest SOS in the nation! Your ranking will go 'through the roof'! In the world of computer rankings, pronouncing jealous curses upon your former opponents is a stupid way to seal your own team's demise. It's first of all spiritually bankrupt, and it defies the basic rules of mathematics. Even when your team's season comes to an abrupt end in a postseason playoff defeat, it's in your best interest to cheer on the victors. Because if you're going to lose, it would speak better for your team if you lost to the champions than if you lost to a 'flash in the pan' who fizzled out in the next round. Last week we posted the projected scores of the top 20 div. 1 teams. 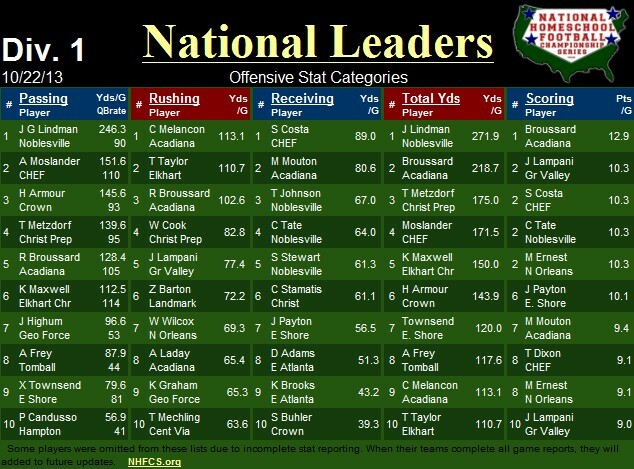 This projection was done by the Computer services of the Freeman Scoring (the service which Maxpreps uses for all their national rankings). Now that the scores are mostly in, I took some time to graph the variance between the final game score and the posted pregame expectations of MaxPreps. The new Ratings update will reflect this variance. As to how much of a correction? That question is above our pay-grade. But moving your Power Rating up or down, is all about meeting the computer's expectations. The chart shows how each of the top Div. 1 teams did this week, in relation to their expected performance. The teams with Green bars can expect an improvement in their power ratings, tomorrow. The teams with red bars may take a hit. Be sure to accurately list any playoff games on your Maxpreps schedules. Playoff games are given special treatment by Maxpreps Rankings. A playoff game counts for more than twice( 2.1) the impact of a regular season game. When you win a playoff game against a tough opponent, your rating really jumps!